This Honey Cake recipe is the best honey cake recipe yet. Honey Cake is very popular among Slavic people, but just like everything else, it has many variations. For example, I like my Honey Cake with chopped prunes on each cream layer of the honey cake. It is a personal preference, but I tell you it goes so well with this recipe. So its up to you. I suggest you try it, and see for yourself. Also, I doubled my cake recipe and frosting recipe to make a 10 inch seven-layer cake, which serves 18-20. So what you see on the pictures is a double batch. 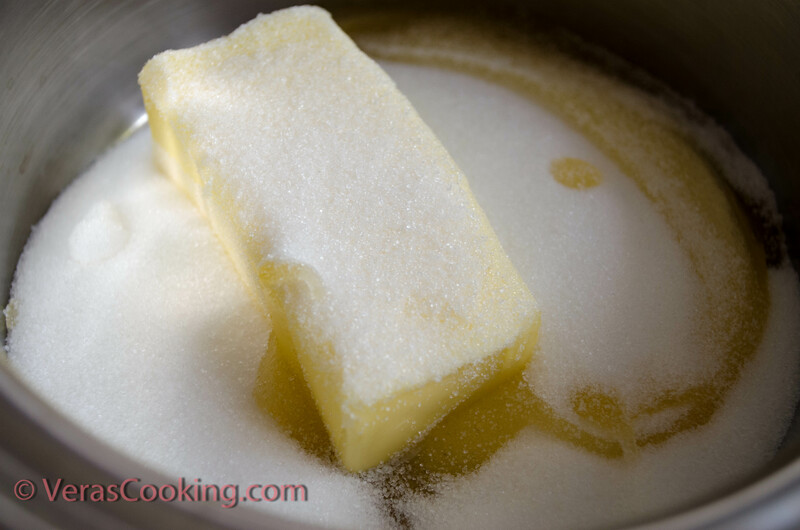 Over low heat melt butter, sugar and honey. Mix until sugar is dissolved. Mix baking soda with lemon juice or vinegar, or cognac. I used cognac, it gives a very nice flavor to the cake. Add this mixture to the pot with honey. It will bubble. Remove from heat, let cool for couple of minutes. 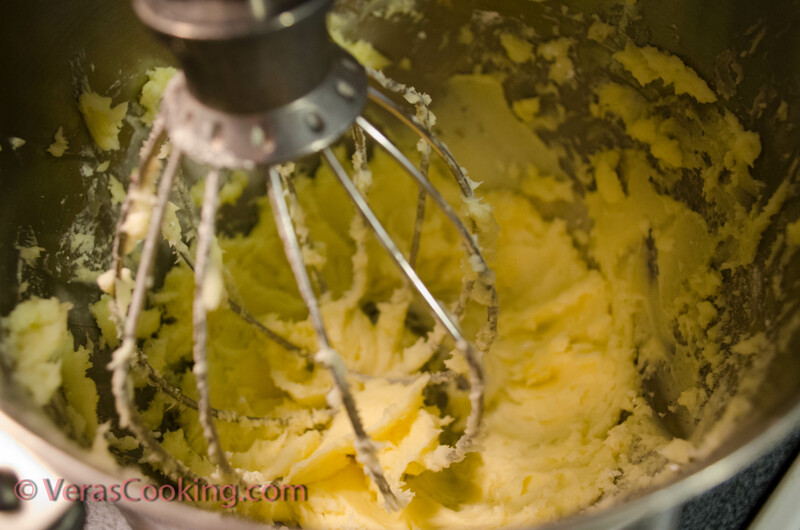 Meanwhile, whisk eggs. 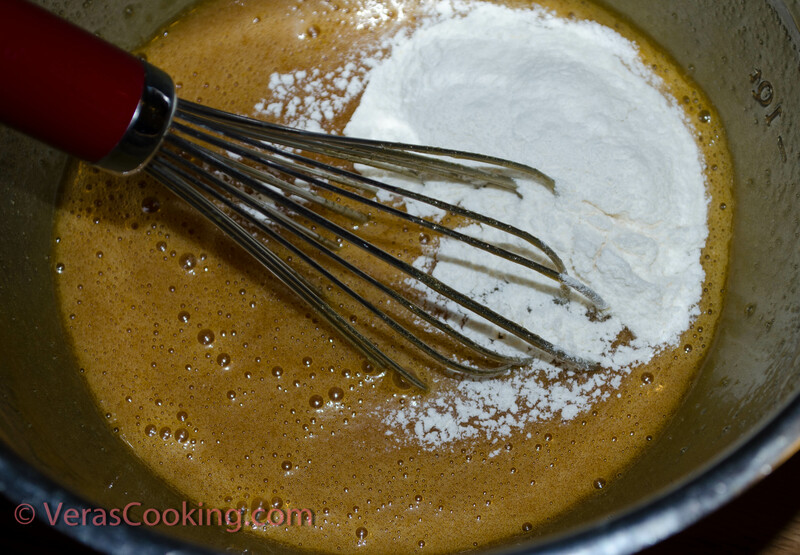 Add eggs to the honey mixture slowly, whisk until well combined. 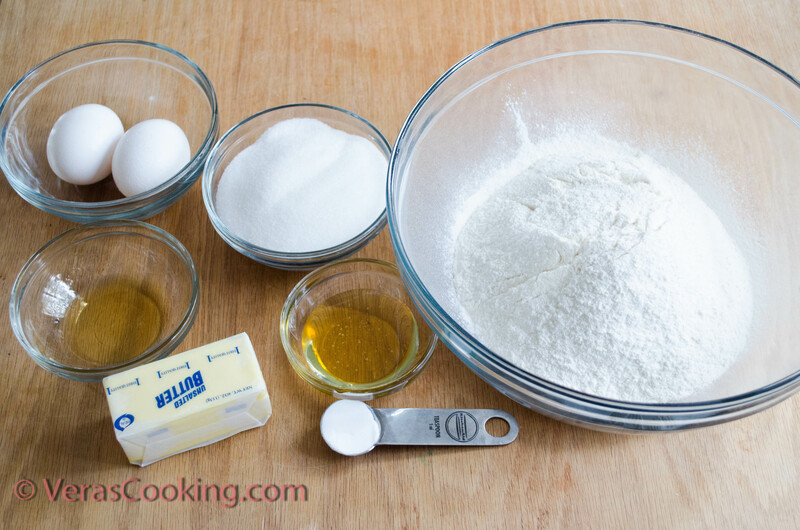 Start mixing in sifted flour, little bit at a time. You will end up with very sticky dough. Cover the bowl with plastic wrap, and refrigerate for half an hour. 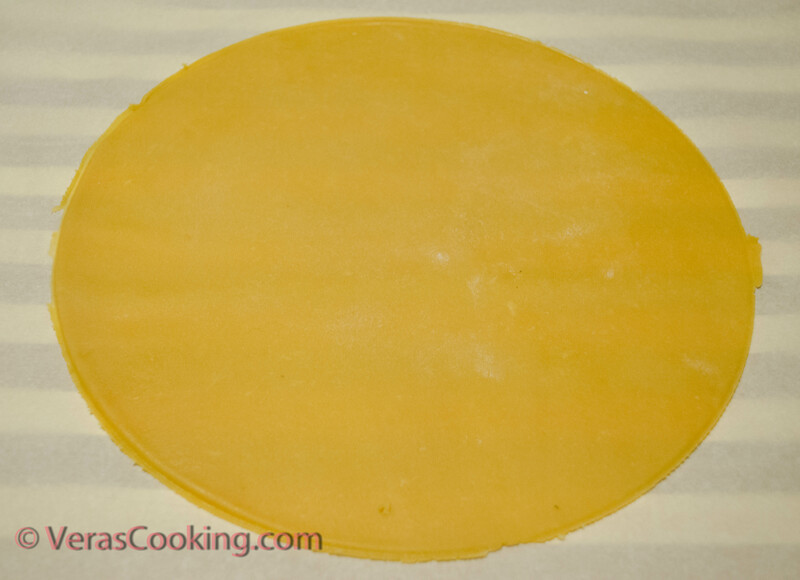 After the dough has been chilled, divide it into 6 equal pieces. 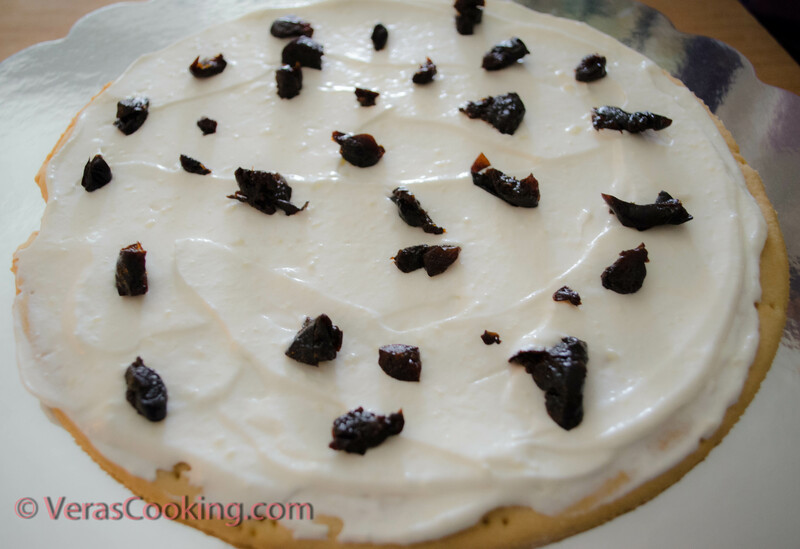 To assemble the Honey Cake, on cake plate place one layer, spread cream, place chopped prunes over cream (if using), top it with another layer, and continue until you have 5 layers. 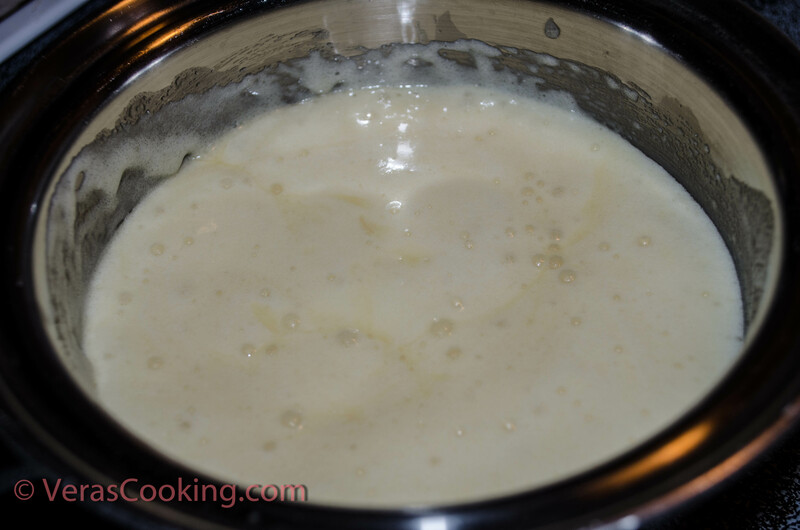 Over top layer spread cream, leaving some for the sides. Before you get to the sides, let the cake settle for about half an hour, then spread the remaining cream over the sides of the cake. 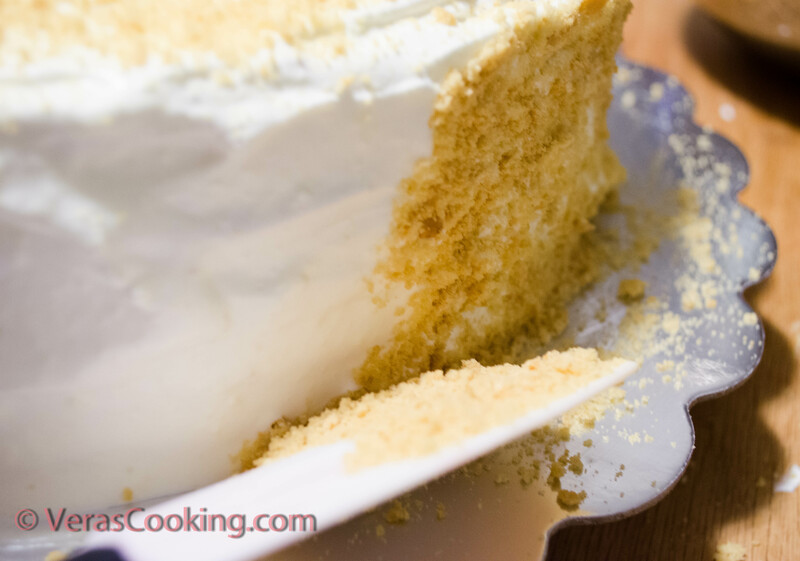 Make crumbs out of left over layer, and cover the cake with crumbs. Decorate with fruits or whatever you like. I’ve got this beautiful idea for fruit arrangement from Google images. This recipe is good for 8 inches 5-layer cake. 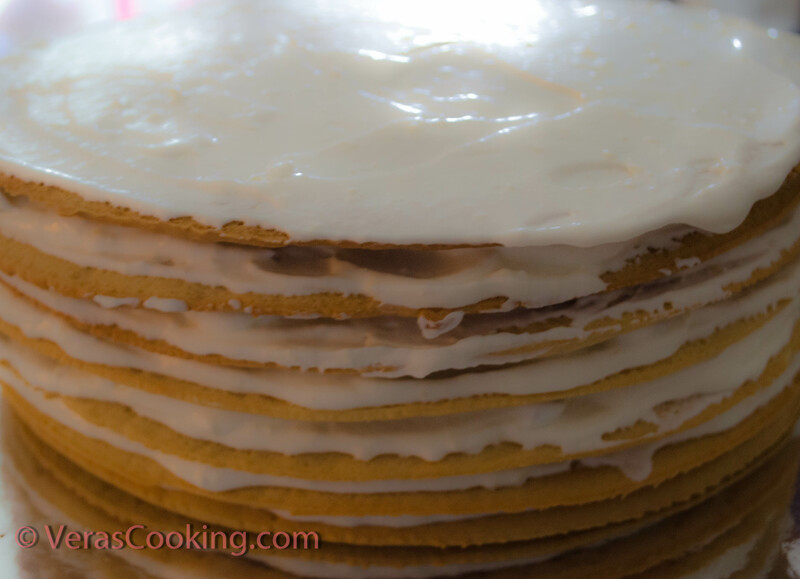 To assemble the Honey Cake, on cake plate place one layer, spread cream, place chopped prunes over cream (if using), top it with another layer, and continue until you have 5 layers. 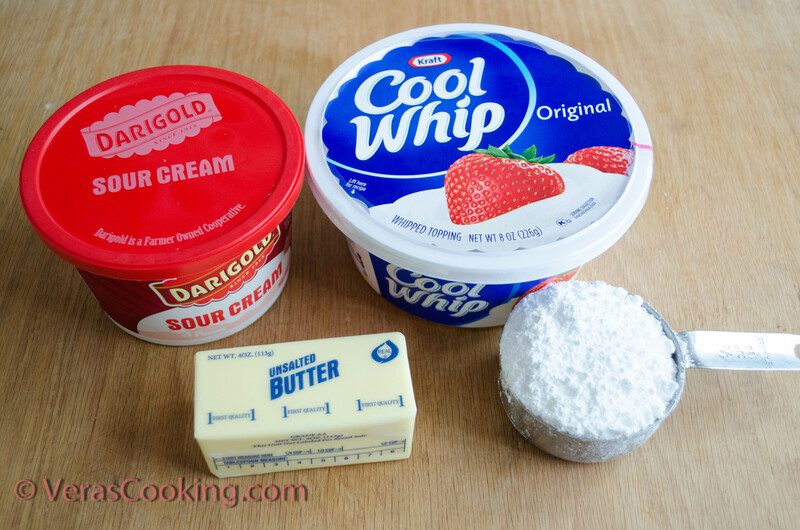 Over top layer spread cream, leaving some for the sides. 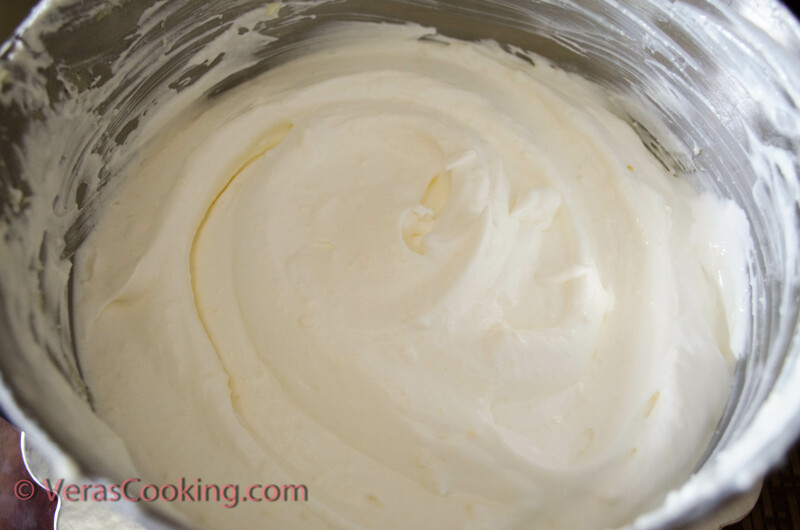 Before you get to the sides, let the cake settle for about half an hour, then spread the remaining cream over the sides of the cake. 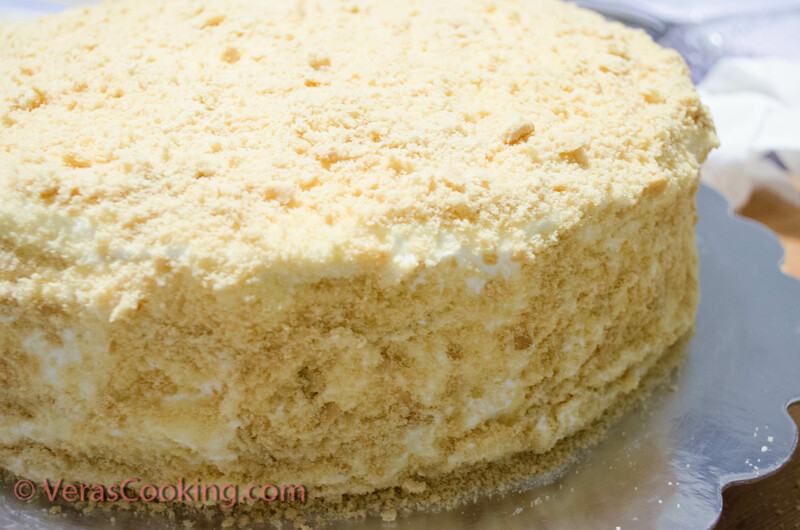 Make crumbs out of left over layer, and cover the cake with crumbs. Decorate with fruits or whatever you like. Thank you, dear Fae, for your kind words. Quick question for you, please. How many eggs are in this recipe? I see eggs in direction 3… Thanks!!! Its all fixed now. The dough needs to be chilled in the refrigerator. So I assume that if you leave it in the fridge overnight, it should be fine. I wouldn’t freeze it. I personally, wouldn’t put fresh fruit inside this cake. 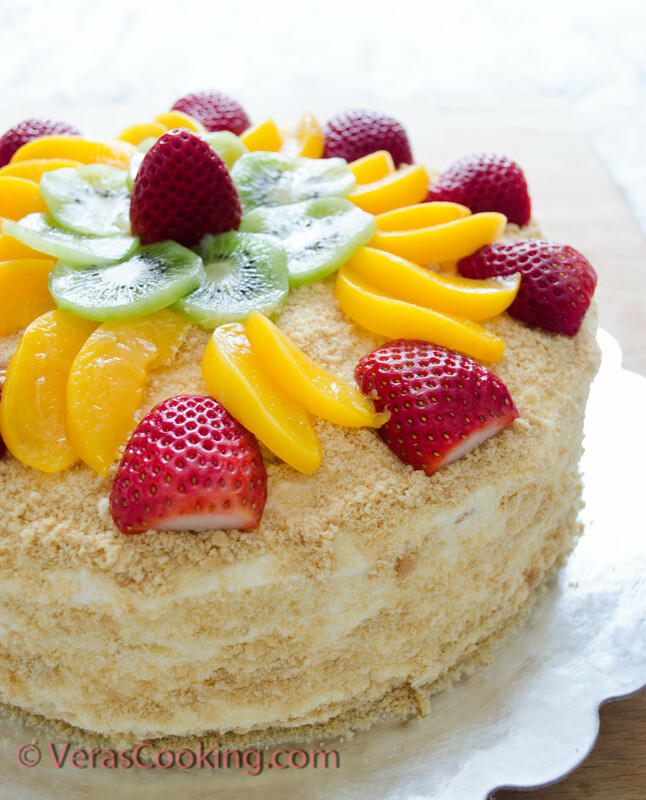 This particular cake needs time to settle, by the time it’s ready the fresh fruit will be all soggy. So I stick to dried fruit for the inside of the cake.